“All manner of sin and blasphemy shall be forgiven to men: but the blasphemy against the Holy Spirit shall not be forgiven to men. And whoever speaks a word against the Son of man, it shall be forgiven him: but whoever speaks against the Holy Spirit, it shall not be forgiven him, neither in this world, neither in the world to come” (Matthew 12:31-32). “But woe to you, scribes and Pharisees, hypocrites!” (Matthew 23:13). The Son of man has been witnessed, God Himself has been openly revealed, God’s glory has issued forth, as the sun shines in its strength! God’s glorious countenance shines dazzlingly; whose eyes dare treat it with defiance? Defiance means death! Christ comes during the last days so that all those who truly believe in Him may be provided with life. His work is for the sake of concluding the old age and entering the new one, and is the path that must be taken by all those who would enter the new age. If you are incapable of acknowledging Him, and instead condemn, blaspheme or even persecute Him, then you are bound to burn for eternity, and shall never enter the kingdom of God. For this Christ is Himself the expression of the Holy Spirit, the expression of God, the One whom God has entrusted to do His work on earth. And so I say that if you cannot accept all that is done by Christ of the last days, then you blaspheme the Holy Spirit. The retribution that should be suffered by those who blaspheme the Holy Spirit is self-evident to all. I also tell you that if you oppose Christ of the last days, and deny Him, then there is no one who can bear the consequences on your behalf. Furthermore, from this day onward you will not have another chance to gain the approval of God; even if you try to redeem yourself, you will never again behold the face of God. For what you oppose is not a man, what you deny is not some puny being, but Christ. Are you aware of this consequence? You have not made a small mistake, but committed a heinous crime. … We trust that no country or power can stand in the way of what God wishes to achieve. Those that obstruct God’s work, resist the word of God, disturb and impair the plan of God shall ultimately be punished by God. He who defies the work of God shall be sent to hell; any country that defies the work of God shall be destroyed; any nation that rises up to oppose the work of God shall be wiped from this earth, and shall cease to exist. When the people have all been made complete and all the nations of earth become Christ’s kingdom, then will be the time when the seven thunders peal. The current day is a stride forth in the direction of that stage, the charge has been unleashed on the coming time. This is God’s plan—in the near future it will be realized. However, God has already accomplished all which He has said. Thus, it is clear that the nations of earth are but castles in the sand trembling as high tide nears: The last day is imminent and the great red dragon will topple under God’s word. To ensure that God’s plan is carried out successfully, the angels of heaven have descended upon earth, doing their utmost to satisfy God. The incarnate God Himself has deployed to the field of battle to wage war on the enemy. Wherever the incarnation appears, so the enemy is destroyed from that place. China is the first to be annihilated, to be laid to waste by the hand of God. God gives absolutely no quarter to China. As I turn My face to the universe to speak, all mankind hears My voice, and thereupon sees all the works I have wrought throughout the universe. Those who go contrary to My will, that is to say, who oppose Me with the deeds of man, will fall down under My chastisement. … The many nations within the universe will be partitioned afresh and replaced by My nation, so that the nations upon the earth will disappear forever and become a nation that worships Me; all the nations of the earth will be destroyed, and will cease to exist. Of the human beings within the universe, all those belonging to the devil will be exterminated; all who worship Satan will be laid low by My burning fire—that is, except for those now within the stream, the rest will be turned to ashes. When I chastise the many peoples, those in the religious world will, in differing degrees, return to My kingdom, conquered by My works, because they will have seen the advent of the Holy One riding on a white cloud. All of humanity will follow their own kind, and will receive chastisements varying with what they have done. Those who have stood against Me will all perish; as for those whose deeds on the earth have not involved Me, they will, because of how they have acquitted themselves, continue to exist on the earth under the governance of My sons and My people. I will reveal Myself to the myriad peoples and the myriad nations, sounding forth with My own voice upon the earth to proclaim the completion of My great work for all mankind to see with their own eyes. The world is falling! Babylon is in paralysis! The religious world—how could it not be destroyed by My authority on earth? Who still dares to disobey and oppose Me? The scribes? All religious officials? The rulers and authorities on earth? The angels? Who does not celebrate the perfection and fullness of My body? Among all peoples, who does not sing My praises without cease, who is not unfailingly happy? … How could the countries on earth not perish? How could the countries on earth not fall? How could My people not cheer? How could they not sing with joy? When people blaspheme God, when they anger Him, He issues a verdict, and this verdict is His final outcome. It is described this way in the Bible: “Why I say to you, All manner of sin and blasphemy shall be forgiven to men: but the blasphemy against the Holy Spirit shall not be forgiven to men” (Mat 12:31), and “But woe to you, scribes and Pharisees, hypocrites!” (Mat 23:13). However, is it recorded in the Bible what the outcome was with those scribes and Pharisees, as well as those people who said He was mad after the Lord Jesus said these things? Is it recorded if they suffered any punishment? It is certain that there wasn’t. Saying here that there “wasn’t” isn’t that it wasn’t recorded, but in fact there was no outcome that could be seen with human eyes. This “wasn’t” elucidates an issue, that is, God’s attitude and principles for handling certain things. God’s treatment of people who blaspheme or resist Him, or even those who malign Him—people who intentionally attack, malign, and curse Him—He does not turn a blind eye or a deaf ear. He has a clear attitude toward them. He despises these people, and in His heart He condemns them. He even openly declares the outcome for them, so that people know that He has a clear attitude toward those who blaspheme Him, and so that they know how He will determine their outcome. However, after God said these things, people still could rarely see the truth of how God would handle those people, and they could not understand the principles behind God’s outcome, His verdict for them. That is to say, mankind cannot see the particular attitude and methods God has for handling them. This has to do with God’s principles for doing things. God uses the advent of facts to deal with the evil behavior of some people. That is, He does not announce their sin and does not determine their outcome, but He directly uses the advent of facts to allow them to be punished, to get their due retribution. When these facts happen, it is people’s flesh that suffers punishment; it is all something that can be seen with human eyes. When dealing with some people’s evil behavior, God just curses them with words, but at the same time, God’s anger comes upon them, and the punishment they receive may be something people cannot see, but this type of outcome may be even more serious than the outcomes that people can see of being punished or being killed. This is because under the circumstances that God has determined not to save this type of person, to no longer show mercy or have tolerance for them, to provide them with no more opportunities, the attitude that He takes toward them is to put them aside. What is the meaning of “put aside”? The meaning of this term on its own is to put something to one side, to no longer pay attention to it. Here, when God “puts aside,” there are two different explanations of its meaning: The first explanation is that He has given that person’s life, that person’s everything over to Satan to deal with. God would no longer be responsible and He would no longer manage it. Whether that person were mad, or stupid, and whether in life or in death, or if they descended into hell for their punishment, it would have nothing to do with God. That would mean that that creature would have no relation to the Creator. The second explanation is that God has determined that He Himself wants to do something with this person, with His own hands. It is possible that He will utilize this kind of person’s service, or that He will utilize this kind of person as a foil. It’s possible that He will have a special way of dealing with this type of person, a special way of treating them—just like Paul. This is the principle and attitude in God’s heart of how He has determined to deal with this kind of person. So when people resist God, and malign and blaspheme Him, if they aggravate His disposition, or if they reach God’s bottom line, the consequences are unthinkable. The most severe consequence is that God hands their lives and their everything over to Satan, once and for all. They will not be forgiven for all of eternity. This means that this person has become food in Satan’s mouth, a toy in its hand, and from then on God has nothing to do with them. Can you imagine what kind of misery it was when Satan tempted Job? Under the condition that Satan was not permitted to harm Job’s life, Job still suffered greatly. And isn’t it even more difficult to imagine the ravages of Satan a person would be subjected to who has been completely handed over to Satan, who is completely within Satan’s grasp, who has completely lost God’s care and mercy, who is no longer under the Creator’s rule, who has been stripped of the right to worship Him, and the right to be a creature under God’s rule, whose relationship with the Lord of creation has been completely cut off? Satan’s persecution of Job was something that could be seen with human eyes, but if God hands over a person’s life to Satan, its consequence will be something that no one can imagine. It’s just like some people being reborn as a cow, or a donkey, or some people being taken over, possessed by unclean, evil spirits, and so on. This is the outcome, the end of some people who are handed over to Satan by God. From the outside, it looks like those people who ridiculed, maligned, condemned, and blasphemed the Lord Jesus did not suffer any consequences. However, the truth is that God has an attitude for dealing with everything. He may not use clear language to tell people the outcome of how He deals with every type of person. Sometimes He does not speak directly, but He does things directly. That He does not speak about it doesn’t mean there isn’t an outcome—it is possible that the outcome is even more serious. From appearances, it seems God does not speak to some people to reveal His attitude; in fact, God has not wanted to pay them any mind for a long time. He does not want to see them anymore. Because of the things they have done, their behavior, because of their nature and their essence, God only wants them to disappear from His sight, wants to hand them over directly to Satan, to give their spirit, soul, and body to Satan, to allow Satan to do whatever it wants. It is clear to what extent God hates them, to what extent He is disgusted by them. If a person angers God to the point that God doesn’t even want to see them again, that He will completely give up on them, to the point that God doesn’t even want to deal with them Himself—if it gets to the point that He will hand them over to Satan for it to do as it will, to allow Satan to control, consume, and treat them in any way—this person is thoroughly finished. Their right to be a human has been permanently revoked, and their right as a creature has come to an end. Isn’t this the most serious punishment? 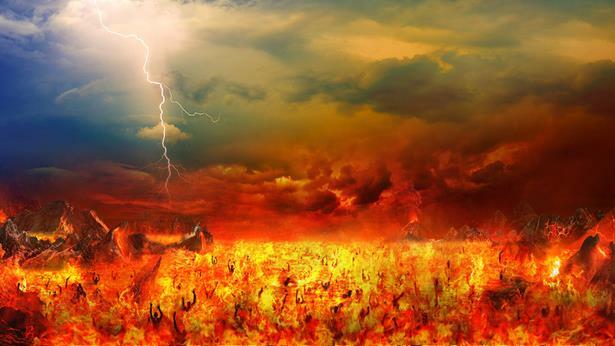 If you condemn God, He will annihilate you, He will have you destroyed in hell, place you in the lake of fire and brimstone to be burnt for all eternity. Look at the Israelites, who crucified the Lord Jesus—what retribution befell them? Forty-odd years later, a Roman general by the name of Titus led an army of one hundred thousand and destroyed Israel. The Israelites were forced into exile, becoming a diaspora wandering across the world for refuge. The Israelites beseeched God over and over, “Why are we reduced to being slaves in other nations? Why is our race facing such an unprecedented plight? Why didn’t You rescue us when our children, even infants, were being slaughtered? Why do You hide Your face from us?” They were even trying to reason with God. God’s response was: “Serves you right! You deserve your punishment. This is your retribution for crucifying God. Because you condemned and crucified the incarnate God, the kingdom of Israel will be destroyed for two thousand years, the people of Israel will be enslaved, slaughtered, and subject to endless, eternal suffering.” Isn’t that retribution? Isn’t that the disposition of God? Nowadays, both religious circles and the great red dragon are condemning Almighty God. When studying the true way and seeking the truth, many people stop and entirely give up when they hear the negative propaganda of the great red dragon and the religious world’s deceptive words. In the end, who will be accountable for the annihilation of these people’s souls? (The great red dragon and the religious world.) This is why God says the great red dragon and the religious pastors and elders are all demons that devour human souls, and fiends that obstruct people’s investigation and seeking of the true way! Why doesn’t God save these people, then? For one, they don’t love the truth in essence; for another, their ruination is to convict the great red dragon, convict the sins of this age, and settle the score with the people of this age. Finally, God said: “I want to nail people of the whole universe to the cross upside down. Since you crucified Christ, I will crucify you all!” This is the disposition of God. Therefore, no matter how you resist God, He will pay you no mind. He does not seem overtly angry; there is no perceptible rumbling. He doesn’t seem to take notice, but just you wait. God never rushes His deeds. After the Israelites crucified the Lord Jesus, retribution didn’t come upon them until forty years or so later. Wasn’t that the case? Currently, there are many evildoers. God simply ignores them, as if He doesn’t see or pay attention to them. God has His own arrangements and timing. When their evildoing gets to a certain point, retribution will come upon them. Isn’t retribution starting to take a toll on the great red dragon? Infighting is emerging within the Chinese Communist Party. The more crackdowns against corrupt officials there are, the more intense and explosive the infighting will become, and the more chaos there will be. Isn’t it so? Chaos will reign and retribution will come. As the sayings go, “What goes around comes around. You reap what you sow. Sin makes its own hell, and goodness its own heaven. It is only a matter of time.” Now retribution is coming, and the words of Revelation have been fulfilled: “My reward is with Me, to give every man according as his work shall be” (Rev 22:12). Is there any retribution occurring now? Can you see this clearly? The existence of retribution is evidence of God’s rule and of His righteousness. In fact, the religious community’s history of resistance to God goes back at least to the end of the Age of Law. When God was incarnated and did His work for the first time during the Age of Grace, the religious community had already been taken over by the Pharisees and antichrists. It became the main opposition force to the Lord Jesus’ work of redemption. When Almighty God, Christ of the last days, appears and does His work, those in the religious community still stand as an enemy force to God’s judgment work in the last days. Not only do they fanatically condemn and blaspheme against Almighty God, they collaborate with the CCP satanic regime to capture and persecute those who bear witness to Almighty God. They have committed the heinous sin of crucifying God again! Not only did the Lord Jesus curse the Pharisees that they were evil in essence, revealing the darkness of the religious community, but when Almighty God does His work of judgment in the last days, He also exposes the pastors and elders’ true essence: their resistance to God. In addition, He curses the antichrists that once again crucify God. This really is thought-provoking! Both times God was incarnated, He condemned and cursed the religious community. What does this show? God’s elect finally understand that the religious community, Babylon the great, is destined to fall. The religious pastors and leaders believe in God in name only, but never really exalt God or bear witness to Him. They definitely do not follow His will. They cannot bring God’s elect before Him. They certainly cannot lead them down the right track of faith in God, so that they understand the truth and know God by practicing and experiencing His words. The religious leaders completely go against God’s will. They do not practice the Lord’s words themselves, but preach biblical knowledge and theological theory to show off and make people look up to them and worship them. They lead the believers on the God-resisting path of the Pharisees. They hurt and ruin many of God’s elect. This is enough to prove that the religious leaders have all become Satan’s tools, genuine antichrists. During the three stages of His work to save mankind, God has been incarnated twice to redeem humanity and save humanity. The entire religious community is the enemy of Christ; they have become stumbling blocks to God’s work of salvation. They have crucified God twice and have broken God’s heart; they have offended God’s disposition. How could they not be cursed and punished by Him? It is just as the prophecies in Revelation say, “Babylon the great is fallen, is fallen, and is become the habitation of devils, and the hold of every foul spirit” (Rev 18:2), “Babylon is fallen, is fallen, that great city, because she made all nations drink of the wine of the wrath of her fornication” (Rev 14:8), “Alas, alas that great city Babylon, that mighty city! for in one hour is your judgment come” (Rev 18:10). Those that resist God, interrupt and disturb God’s work will definitely receive punishment and retribution from God. This is determined by God’s righteous disposition. As is known to all, in the Age of Law, the citizens of Sodom publicly denied God and resisted Him. They enraged His disposition and were all destroyed by God; they were burned to nothing by the fire from heaven. During the Age of Grace, the Jewish chief priests, scribes and Pharisees publicly resisted and condemned the Lord Jesus. Eventually, they colluded with the Roman government to crucify the Lord Jesus. They committed a grave sin that provoked God’s disposition. The entire Jewish nation was subjected to unprecedented destruction. In the last days, the religious leaders wantonly judge, resist and condemn Almighty God. They even cooperate and collude with the CCP devil to suppress, arrest and persecute those brothers and sisters who spread the gospel of the kingdom. They have already committed the heinous sins of blaspheming against the Holy Spirit and recrucifying God on the cross. Isn’t their evil behavior even worse than that of the men of Sodom? Isn’t it incomparably worse than that of the Jewish Pharisees? They are the antichrists exposed by God’s work during the last days. They are the religious evil force that has resisted God more severely and fanatically than any other force in history! The religious community is composed entirely of evil forces that resist God. It is a nest of antichrist demons. It is a staunch bastion which tries to stand with the kingdom of Christ as an equal. It is a satanic camp of sworn enemies to God that stubbornly rebel against Him! God’s righteous disposition cannot be offended. God’s holiness cannot be besmirched! God’s work in the last days is the dawning of a new age and the end of the old one. The religious community that is controlled by all manner of antichrist demons as well as this evil world will be destroyed soon by God’s disaster in the last days. God’s righteous punishment has already arrived! It’s just as Almighty God says, “The world is falling! Babylon is in paralysis! The religious world—how could it not be destroyed by My authority on earth?” (“Chapter 22” of God’s Words to the Entire Universe in The Word Appears in the Flesh).